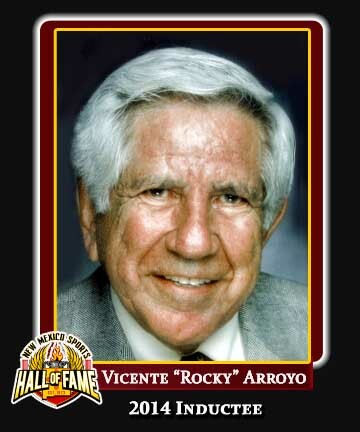 Born Oct. 4, 1925, Vicente “Rocky” Arroyo’s outstanding achievements began early and snowballed over his lifetime, and not all of them were related to sports. Twice at El Paso’s Burleson Elementary this son of Mexican immigrants skipped grades on the recommendation of teachers recognizing his academic abilities, so he was just 12 when he entered El Paso High School as a freshman. He was obviously a skilled athlete: In 1941 he was a 15-year-old member of the El Paso Tigers team that defeated Abilene for the Texas high school basketball championship. He wouldn’t let athletics get in the way of his academics; he graduated from high school at 16 and attended summer school at the Texas School of Mines, but a degree in electrical engineering wasn’t offered there. So Arroyo opted to head to the University of New Mexico. “It had nothing to do with athletics or an athletic scholarship. I was good in math and I wanted that electrical engineering degree,” he said, securing his EE degree from UNM in four years while competing in varsity basketball, baseball and football. The Lobos’ only two Border Conference titles came in Arroyo’s first two varsity seasons (1943-44 and 1944-45), although several Border Conference schools closed or cut back in light of students going off to war. The Lobos won a more impressive title in 1944-45 with a 14-0 record against college competition — in a much stronger field that included the pre-war conference schools. Despite his electrical engineering degree, Arroyo still had basketball in his veins in 1946, when he was named head coach at Our Lady of Sorrows in Bernalillo. There, Arroyo found a dirt basketball court — until he was able to talk a Sandoval County commissioner into laying down asphalt. At 20, Arroyo was too young to vote, but he was able to teach and coach players who were near his own age. The quality of his college degree was a big factor in being selected because schools were in desperate need of math teachers; Arroyo could teach algebra and calculus, unlike most physical education majors. Arroyo steadily built the town of Bernalillo’s basketball legacy. In the District 3 basketball tournament, the Bernalillo-OLOS hybrid school got past the first round in both 1946-47 and 1947-48, finding itself seeded second behind Socorro in the 1948 tournament (the same year he was on the Mexican Olympic team). In 1954, Arroyo left Bernalillo for a job at the brand new “big school,” Valley High, but after one season he decided he wanted to pursue the opportunities that had opened up after the war in his degree specialty and he got a job at Sandia National Laboratories. He didn’t give up basketball, and became a referee at the high school and small-college level. He called the state basketball tournament at least six times from 1960-72 and, as a WAC football official, worked four Sun Bowls, the Japan Bowl, Peach Bowl, Fiesta Bowl and Rose Bowl, and also officiated games at Notre Dame, Texas, Oklahoma and UCLA. Arroyo, now 89, still lives in Albuquerque.